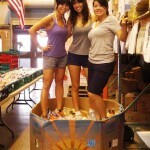 Less than 72 hours before our trip to Oahu – Team Boobs4Food decided to re-contact Hawaii Food Bank to see if they were open to having us lend a helping hand. Since our greater goal here at Boobs4Food is to bring hunger awareness to a global scale – we wanted to see if we could devote some quality time during our holiday to a cause such as the Hawaii Food Bank. Annie C. at Hawaii Food Bank replied back to us quickly and gave us the okay to allow us to drop-in and help them out in their “house” given our recent Boobs4Food activities that we’ve documented. An opportunity to drop-in, which is very rare as the Hawaii Food Bank usually requires volunteers to make 6-month commitments, got us all very excited for our holiday. We immediately felt the island aloha upon our arrival as we were given a brief tour and introductions to the team. We hit the ground running as we sorted through refrigerated perishables such as orange juice, dairy products, inspected cartons of eggs for cracks, frozen foods and finally we sorting fresh bread & baked goods for freshness and mold. With our past experience in sorting frozen penne & green beans, and produce, our event at Hawaii Food Bank allowed us to see another angle of how food banks operate. After all the sorting and inspection is done, agencies from around the island come through and shop through the bank at a flat rate of just cents per pound of food. This opportunity was wonderful to see how it all works halfway across the Pacific. The Hawaii Food Bank happens to get quite a bit of fresh produce from not only local supermarket chains such as Safeway & Whole Foods but also from local farmers from around the island. We enjoyed getting to know the other volunteers, how the food bank runs their operations and why these volunteers devote their time and efforts to a cause such as Hawaii Food Bank. Overall, this experience was a lot of fun and even included jumping in the moldy bread bin to maximize room. We look forward to coming back to help the Hawaii Food Bank out again on our future trips to the island and to share our Aloha Spirit in the form of fighting hunger alongside with them. Check out and support the Hawaii Food Bank!